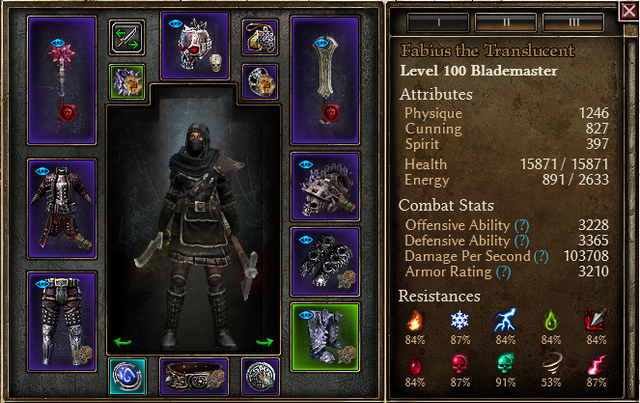 Inspired by JoV's Defiance Blademaster with revised tanking methods and a moderate reshuffling of gear. Also, I don't like Aleksander's meteor. Tankiness: This build has pretty much all the defenses you could ask for: a decent HP pool, 4.5 second PB, damage reduction, a shield, good DA, phys resist/armor, dodge/deflect, fumble, overcapped resists, and a circuit breaker. Unless you play around in poison pools or aetherfire, you aren't dying anytime soon. High resists: Your worst is at 84%, and you soak a wonderful 91% aether damage, or 93% with consumables. Flat damage: Just shy of 2H levels, and getting even more is a cinch. Racial damage: This build shines at deleting Grava/Aleks right as the wave starts. RR: A respectable ~80% on most things, and permanent War Cry. 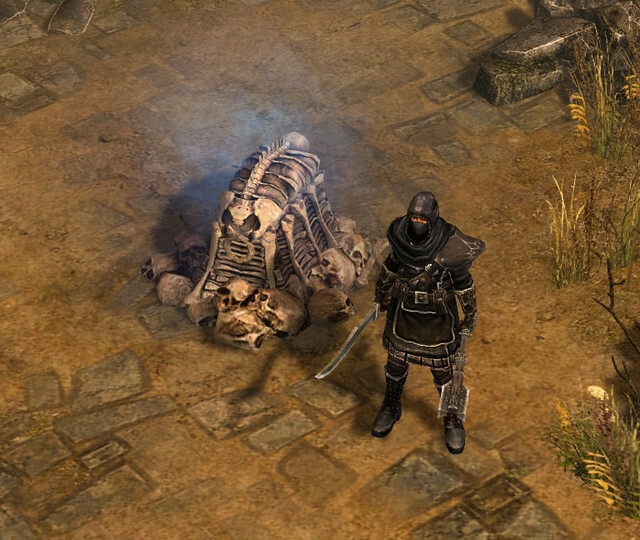 Reflect: You'll find out that the random skeleton has an "of Valor" shield the hard way. At least you have a circuit breaker and PB to mitigate the trauma hits you take. Poison Resist: When a crucible mutator gives enemies poison damage those ticks will hurt when Anesteria or Reaper hit you with RR. Double greens: you know them, you love them. The usual aversion to fumble, ground effects, reduced damage, etc. Fortunately, we're great at blowing Grava away the moment he pops up. Mythical Undying Oath: gives doubled flat damage, decent resists, HP, faster PB, and a (somewhat useless) max resist. Ever sine Rylok Marks stopped giving %DA, this is probably our BiS. Mythical Avenger of Cairn: All our resist goodness, along with +skills, DA, and HP. We get nothing from its skill mods, but it's not like the conduits do anything for us either. It's also not going to burn through your Ugdenbloom supply trying to craft the right one. Ancient Stoneplates of Kings: One double rare green. If you're short on scrap and bits, these can be swapped out for Runeguard Greaves, which cost health and chaos resist in exchange for a second shield and skill points. You'll probably want to use Ulo in crucible if you like your overcap. Dread Lord's Living Ring: We really want that chaos resist and ADCTH to fill the gaps between PBs. If you don't fancy the required gardening, an ordinary ring with the same affixes will cost you a bit of vit overcap and HP, but do the same thing. For a more offensive route, other MI rings work too. Consumables: For 150-170 runs, I like to keep Aetherward Oil and Courageous Tinctures on my hotbar. Aetherward gives rounds out racial damage to include Aetherials as well. With this up, you deal 40% extra damage to Aleks and can wipe him before he gets to casting. Courageous tinctures are great for waves 160 and 170, but with an actual cooldown, have to be managed more carefully. Because the three bottom nodes of Menhir are great, it's easy to throw in an extra 3 blue for Empyrion. With conversion, this gives decent flat damage, even more max chaos/aether resist, and an AoE that doesn't take up a weapon skill. Comparatively, Oleron does more damage, but it needs more purple points to get there and its proc makes us juggle it with Assassin's mark. Harp mitigates our energy issues and procs extra OA/DA, freeing a medal slot for tainted heart or runebound topaz. Crab and Scepter pay for themselves when filled out, sparing a few points from Wolverine and Dagger. Aleks: He's a glass cannon when you're around, but his meteor will still hurt, especially with other nemeses in the mix. He's not as bad as Grava, but generally your second pick for a kill. Grava: It's not enough that fumble costs you damage, it also costs you consistency. Fortunately, with a 22% racial bonus against him, it's a quick kill. Kuba: Without a racial bonus, he's tough and his healing can get annoying, but nothing overwhelming. Kill him after you deal with Grava, Aleks, and Reaper. Other nemeses: All of them do healthy damage and can keep up with you, but aren't annoying or super-fast kills. Of the four, Reaper is the most dangerous and Fabius is the easiest to kill. Zant, Benny, and Moose can't catch you. That one mutator that gives 6% max aether resist: chug your potions, sit and laugh as meteors honk and bounce off you. Solid build. Why not 8/8 Execution? Empowered essence of beronath is still BiS IMO. Hungerer oil from Barrowholm is also great for survivability if you lean that way. Given the relative inefficiency of WPS with Cadence, I figured it's best to get it to the proc cap and leave it there. That being said, where would you suggest pulling points from to make up the difference? Those extra resists and the HP they free up in augments also give a lot more freedom in picking devotions and components. I can see the benefit of +1 to Nightblade and attack speed, but cutting down fighting form and anatomy of murder makes this build way less point-hungry than JoV's version. Last edited by Smitherson; 07-30-2018 at 04:44 AM. looking at the stats it gives a total of 30% racial bonus, where do you get the extra 10%? Imo, hard capping Break Morale is a huge huge damage boost to your build - 10% additional RR for RR hungry build. Belgothian shears or no shears, don't matter much, rather max execution with it (or leave execution at 5 and shears at 5, you have to test it). 16/12 and 12/12 Oleron's Wrath is just 1% oa difference and some flat internal trauma (and 30% phys damage which is not even drop in the water), since I suspect you don't rely on physical dot much, it's not worth 4 points investment over something like Break Morale. Not sure why you invested in Elemental Awakening, for IT damage? Funnily enough, I had already cut out some of the points in awakening (which you correctly surmised was there for IT and elemental resists) and Oleron. Good point on War Cry though, and I'm not sure why I didn't spring for that with my free points. We get 28% from Anatomy of Murder and an extra 15% from Aetherward oil, since Aleksander is an Aetherial. If I'm not mistaken, the two are additive for 43% total. It also lacks the non-chaos max resists, HP and DA that avenger does, in exchange for 100% extra physical damage and a bit of CDR. I did give it consideration, but Avenger is just too good for survivability, while Spellscourge either needs a shield or more of its set.